Then-comedian, now-senator Al Franken violated Leeann Tweeden in December of 2006, forcing himself on her in some kind of mock-rehearsal and groping her while she was sleeping. You can read her story here. This is undoubtedly not an isolated incident, as such audacity in violating another’s dignity and freedom hardly—if ever—occurs in a vacuum. Al Franken is a big supporter of Planned Parenthood. Here he is singing PP’s praises in the following words: “The ability to decide whether or when to start a family shapes lives, and for nearly 100 years Planned Parenthood has played an important role in ensuring that women are able to make that decision for themselves and shape their own destinies. I urge my colleagues to resist the impulse to let politics stand between a woman and her health care, and to oppose legislation to defund Planned Parenthood” (see here). 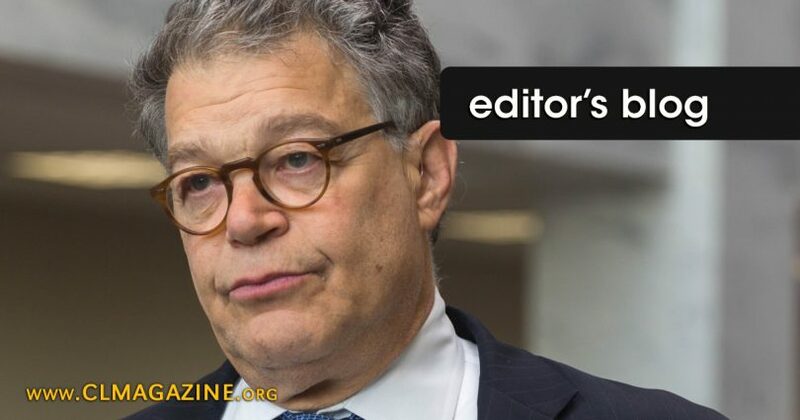 At first, you might think there is no connection here between Al Franken’s support of PP and Al Franken’s violation of Leann Tweeden, but think about it carefully for a moment. The contraceptive mindset that leads Mr. Franken to support PP is a mindset that separates human sexuality from its ultimate purpose, namely, the propagation of the species and rearing of children. Human sexuality is about family, but like PP and its supporters, Al Franken thinks engaging in all kinds of sexual activity (in and outside of marriage) and having a family are separate realities that only come together if/when a woman so desires that they come together. Proponents of this self-centered contraceptive mindset think it is “healthcare” for women to fill their bodies with dangerous chemicals to avoid procreation when freely engaging in the procreative act. A logical extension of this mindset, they also think “healthcare” entails “ending a pregnancy” (i.e., killing a child) if the child is not wanted, even though, in most cases, one freely and knowingly chose to participate in the procreative act that led to the child’s creation. We are talking about a mindset that literally rationalizes killing one’s own children, innocent human beings, to justify a self-centered love of unbridled sexual pleasure that, of its very nature, objectifies human beings and violates their God-given dignity. So, are you surprised that Al Franken violated Leeann Tweeden as he did? His now publicly known acts of sexual misconduct are awful and reprehensible, but should not be surprising. Al Franken’s actions are quite in line with the depraved objectification of human beings that underlies the unnatural and licentious contraceptive mindset to which he, PP, and many others ascribe. Did you hear the one about being nonpartisan?